Western blot analysis of extracts from Ramos and RL-7 cells, vehicle treated (-) or treated with Staurosporine #9953 (1 μM, 60 min; +) using Phospho-MST1 (Thr183)/MST2 (Thr180) (E7U1D) Rabbit mAb (upper), MST1 (D8B9Q) Rabbit mAb #14946 (middle), and MST2 Antibody #3952 (lower). 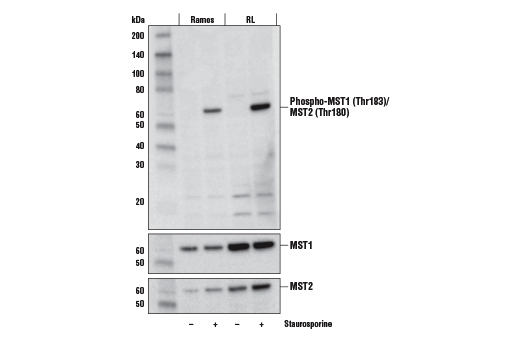 Phospho-MST1 (Thr183)/MST2 (Thr180) (E7U1D) Rabbit mAb recognizes endogenous levels of MST1 and MST2 protein only when phosphorylated at Thr183 and Thr180, respectively. Due to sequence similarities, this antibody may also recognize MST3 (STK24) and MST4 (STK26), but only when phosphorylated at Thr190 and Thr178, respectively. Based on their predicated molecular weights, MST3 and MST4 are not expected to co-migrate with MST1 and MST2. Monoclonal antibody is produced by immunizing animals with a synthetic phosphopeptide corresponding to residues surrounding Thr183 of human MST1 protein.